I really love napping, but on the flip side of the coin, I really like being busy, too. These last few days, Hubs and I have been extremely busy. Per the advice of my sewing instructor, I am trying to sew a little something every day. 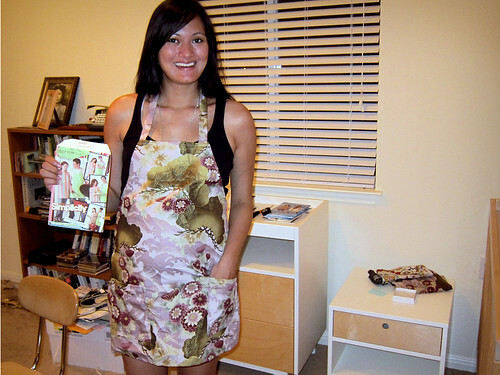 Since Friday I have done a tote bag (in class), refashioned a thrift store dress, and I made an apron and cloth napkins! As this apron is only my third sewing project, EVER, this is the first time that I have ever followed a pattern. Wow. That paper is THIN! I used some scrap fabric left over from an art project I did five years ago, and it turned out great! (Please forgive my make-up free face and messy house. I snapped this photo at midnight last night). 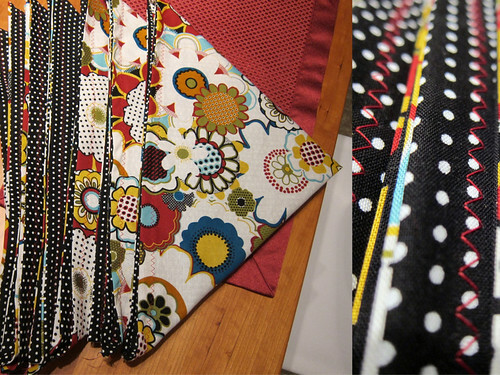 I made these cloth napkins from a tutorial on So Sew Something, my friend Robie's blog. I even incorporated the zigzag finishing stitch! Hubs was impressed that I knocked six eighteen inch napkins out in about 30 minutes. I was pretty pleased, too! Lest you think Adored Austin is going to become a sewing blog, I also made some address labels using a computer, not a sewing machine. I used to pay an Etsy seller in Singapore for my address labels, but no more! I bought some round label stickers from Staples and made 400 for the price I usually pay for 50! I made a giant design in Photoshop, then simply plugged it into the Avery 8293 online editor. It copies them 20 to a sheet, you put the label sheet in the printer, and bammo! 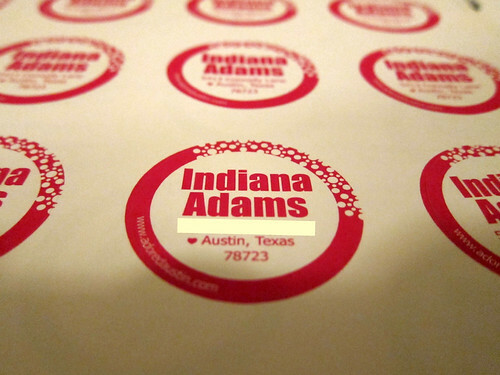 Cute, round, address labels pop out for a fraction of the price of what you usually pay. Plus no waiting on shipping from half way around the globe! Hubs has been bitten by the busy crafty bug, too, only I don't think he likes it when I call his massive home renovations "crafts" despite the fact that men who do such projects are called "craftsmen". Hub's family is driving in from Atlanta this weekend to help us put in a French door (on the left, yellow wall) for Hub's music room/ office. 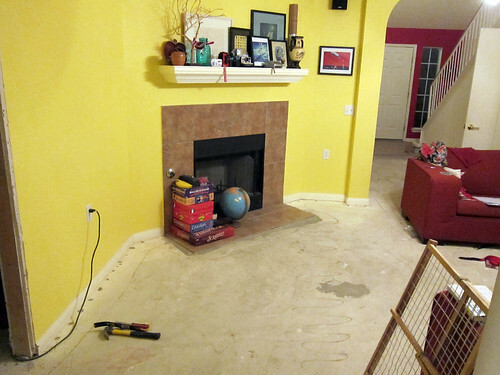 With the help of our sweet City Group, we ripped out the carpet so we can lay down some gorgeous pecan wood floors, too. I can't wait to see what the "after" result is!